As early as I can remember, I was taught about the fall of Satan. In every church I have ever attended, I have been taught this story about Satan. In my 20s, I was attending the School of Biblical Studies with Youth With A Mission. For 9 months, we poured over the Scripture, book by book, verse by verse. I remember specific passages that stood out, and forced me to question Satan's origin. By the end of my studies, I was no longer convinced of the old tale I had been told. Instead, I was unsure of how he became evil. a patchwork of unrelated passages taken out of context. I want to take a short walk through these passages. "How you are fallen from heaven, O Day Star, son of Dawn! I will make myself like the Most High.'" This is a passage which many claim is an account of the fall of satan, or Lucifer. It seems that these verses are ripped out of context. They fall in the middle of a series of judgments against a wide variety of nations. "you will take up this taunt against the king of Babylon:"
'Is this the MAN who made the earth tremble?" These verses are talking about a man, the king of Babylon, who will fall. I'll be honest, I don't know much about double fulfillments, but when applied, scholars seem to be selective which passages they attribute this ... and usually to make a point. The next passage isn't much different. "You were the signet of perfection, full of wisdom and perfection in beauty. ... I cast you to the ground; I exposed you before kings." These few verses are unique, no doubt. "Eden ... anointed cherub ... mountain of God ..."
But to they really refer to Satan and his fall? I don't claim to be a Biblical scholar, but I'm just not convinced. For further reading, here are 2 interesting blog posts. I do not agree with everything this writer has to say about Satan, but these posts are worth a read. Then there's the verse in Luke 10 - "I saw Satan fall like lightning from heaven." Jesus said this to the 72 after they returned from being sent out 2x2 into every town. They were rejoicing that demons were subject to them in the name of Jesus! But my favorite passage, and the one I read every Christmas season ... Revelation 12. "And a great sign appeared in heaven: a woman clothed with the sun, with the moon under her feet, and on her head a crown of twelve stars. She was pregnant and was crying out in birth pains and the agony of giving birth. And another sign appeared in heaven: behold, a great red dragon, with seven heads and ten horns, and on his heads seven diadems. His tail swept down a third of the stars of heaven and cast them to the earth. 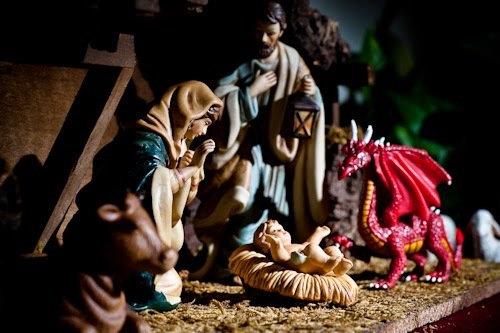 And the dragon stood before the woman who was about to give birth, so that when she bore her child he might devour it ... but her child was caught up to God and to his throne. Now war arose in heaven, Michael and his angels fighting against the dragon. And the dragon and his angels fought back, but he was defeated and there was no longer any place for them in heaven. And the great dragon was thrown down, that ancient serpent, who is called the devil and Satan, the deceiver of the whole world - he was thrown down to the earth, and his angels were thrown down with him." I love that this passage portrays the dragon (satan) as being incredibly powerful. 1/3 of the stars are swept down with just his tail. He sought to devour a woman and her baby ... but was unable to do so. A mighty, powerful dragon was defeated! then Michael is fighting against this same dragon - and his "angels." This is not a picture of a mighty, glorious angelic being, consumed with pride. This is a DRAGON who is thrown down ... and his angels with him. He was in heaven, but was defeated, and there was no longer any place for them in heaven. He is referred to as the "ancient serpent" and the "deceiver of the whole world." I do not see this great, grand glorious angel who is filled with pride and thrown down. No, I see a dragon, a defeated dragon. I believe the passage in John 8:42-46 is a more accurate telling of Satan's history. Verse 44 says, "... He (the devil) was a murder FROM THE BEGINNING, and has nothing to do with the truth, because there is NO truth in him. When he lies, he speaks out of his own character, for he is a liar and the father of lies." This Christmas season, I find great comfort in knowing that Satan was defeated at the coming of Jesus, when He was born as a baby in that manger in Bethlehem. intending to devour a baby ... was unable to do so. Instead he was defeated and thrown down! Christmas is a celebration of great triumph! The Savior of the world defeated the one who seeks to destroy our souls. The one who wants to devour us no longer has any power, because of the baby born in Bethlehem.